I grew up in a family of technologists in New Jersey, home of Edison’s Labs and the birthplace of the transistor.1 Where most families fought about politics or sports at the dinner table, we debated technology. We received computers before we were 6 and our first programming lessons started in elementary school. When our teenage friends were out one winter day, my sister and I were critiquing my father’s talk on using combinatorial techniques in software testing (in truth, we barely understood anything). 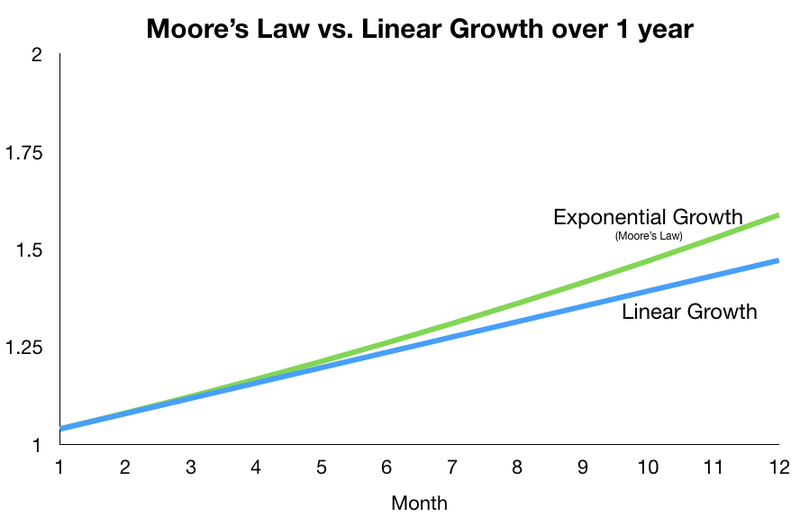 The heartbeat of the technology industry is Moore’s Law, which lets unexpected — often, magical — things happen in astonishingly short periods of time. Most industries have linear changes: products slowly get cheaper, quality consistently improves. The computing industry is defined by exponential changes. The Law — as we refer to it — was first an observation that transistor density doubles every year. Today, it means that computing performance doubles every 18 months. 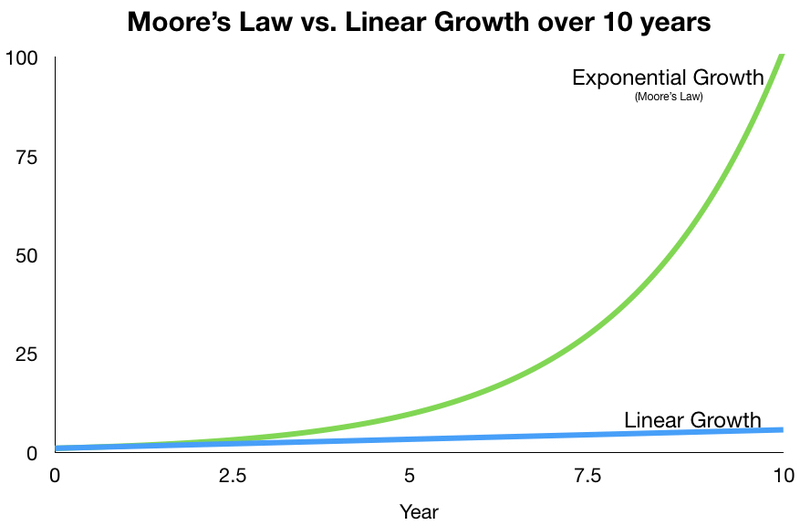 The Law’s exponential spirit applies in every part of technology, including network bandwidth, computer storage, and even telecom network effects. Such an industry rewards people who are opportunistic and entrepreneurial and often plain crazy. After all, a lot of rational people think about the world through linear terms. Youths — teens to early 30s — take a leading role in the tech industry. This encourages risk-taking and new perspectives, while also leading to age discrimination and bad investment choices. In most fields, age means more experience, knowledge, and a larger network. In many professions, people automatically make more money and get promoted as they get older. This has value where the past is a guide to the future and where long relationships are important. To make an impact in some fields, an entrepreneur often needs to have understood the industry or problem space over years. But when the world changes significantly, the experience (and relationships) of old can be counterproductive. A seasoned bank executive or bank programmer’s knowledge doesn’t really map over to a new technology like blockchains/cryptocurrencies, even if both industries have to do with finance. Younger people have lower opportunity costs and often a higher tolerance7 for risk. Consumer technology — like social networks or gaming — often begins among certain young segments before the rest of the population uses it. Younger leaders understand these communities in a way an outsider might not. Sadly, some investors have a line at 32 years old an entrepreneur or startup engineer is too old, even though most evidence shows that successful entrepreneurs are older. Recent research in entrepreneurship has been disproving a lot of myths about founders. For example, can you guess the average age of founders of hypergrowth startup companies? Both views on youth have tradeoffs. A substantial number of industries devalue the early years of their worker’s lives when over-weighting the importance of experience (especially when measured in years of experience rather than richness of experience). In fact, this may just be a simple rationing criteria to dole out favored positions to people who have done the requisite time. But the Valley is much more susceptible to ageism — even when age (and its relevant experience/network) have substantial benefits to the problem at hand. Would be entrepreneurs think that the quality of the idea and its uniqueness decides whether something will succeed. In reality, execution is critical to the success of any business. This is why so many aspiring entrepreneurs do well to dismiss the “X is already doing that” argument. This bias for novelty is all around. Journalists, when deciding what startups to cover, prefer novel startups because this is more interesting to their readers (and therefore more profitable). Renowned scientists become successful from being the first to discover new things, not from slightly modifying existing ideas. By contrast, many tech (and business) success stories start from derivative ideas. Execution is far more important than a brand new idea or strategy. Or rather, new ideas and strategy are just a jumping off point to make true impact. First time founders are obsessed with product. Second time founders are obsessed with distribution. Closet entrepreneurs can often be deterred by the fact that “someone is already doing X”. The question should be what they could see themselves doing, how strong of an executor are they, and what changes are coming in the market. Among technology commentators, outrage grows when a company’s valuation outstrips comparable companies and fundamental business metrics. But many parts of technology is winner take all, with profits lagging by years. Amazon took 14 years to become profitable. Uber is still not profitable. Some companies with little revenue are critical to the success of deep pocketed companies. Network effects and exponential growth are hard to surmount. All these factors justify high valuations. Facebook raised investor capital with a $10 billion valuation in the midst of a worldwide financial crisis in 2009. The company was unprofitable, and the valuation was far above what most pundits expected. At elite business schools and in journalism circles and even amongst famous VCs, there was a consensus: the business was widely overvalued. Of course, there’s countless examples of overvalued failures as well. But for investors, a single winning bet also makes up for tens of failed bets. They’ll often get it wrong, but the one time they get it right will make up for many failures. A consistent criticism of the tech industry is that it sells the idea of transforming our lives for the better, but in reality creates prosaic inventions: rather than solving cancer, the tech industry focuses on yet another food or dating app. For an entrepreneur facing nearly impossible odds, a sense of purpose — changing the world — is a motivating reason that makes up for the challenges they will face. Often, these visions are nothing more than a “false mission” that lets entrepreneurs recruit employees who have a number of other opportunities, increases the likelihood of funding, and is a canny strategy for what the tech media likes to cover. And yet, many revolutions start with dumb (but often ingenious) ideas discovered after much pain. They then have substantial impact when given time to grow — especially when led by the entrepreneurial, innovative people who founded the company. Consumer products especially seem like dumb ideas. But world changing companies started with laughable ideas like a social network for college students or a taxi cab for the elites or renting out air mattresses. “Dumb businesses” are also the training ground for great entrepreneurs. Early business attempts like Elon Musk’s Zip2 or the Jobs/Wozniak Blue Boxes were the practice for the companies they would later build. For entrepreneurs, using a filter of “how world changing is this idea” to decide what idea to pursue is a very dangerous thing. It adds crucial impediments to an already challenging journey. It also ensures many world changing ideas won’t ever be pursued, because their progenitors are not imaginative enough to see where the journey will eventually lead. After all, if the original inventors of the transistor — the building block of all modern electronics — were alive today, they’d likely be amazed at the world their research led to. Siddhartha Dalal is a professor at Columbia University’s School of Professional Studies and Department of Statistics. He previously was the Chief Data Scientist at AIG and the Chief Technology Officer at the RAND Corporation. He started his career at Bell Labs and Bellcore. He has an MBA and PhD in Statistics from the University of Rochester. Alka Dalal was a staff manager at AT&T and a programmer. She received her master’s degree from Rutgers, and bachelor’s and master’s degrees from New York University. She passed away in 2016. Nemil Dalal is a product manager and software engineer. He received his MBA and bachelor’s degrees at Stanford. Preeyel Dalal is a Philanthropy Manager at Goodwill, where she leads a team of fundraisers. She previously was a senior development officer at Accion US. She received her bachelor’s degree from the University of Rochester.